Questioning techniques that show you how to form a sales presentation for any product or service using just 5 types of questions. You'll appear professional and confident as your questions follow an organised logical structure. You'll learn how to talk with your prospect rather than interrogate them. And your presentations and sales closing will be more successful. A wide open question that encourages the prospect to talk. Open questions to get more information and give direction. Specific open questions to narrow down the detail. Alternative questions to learn specific information. Closed questions to confirm specifics. Think of the above as a funnel, a line of information gathering that starts with a wide open question and gradually narrows as you get more specific information. You don't have to use all the questions, they're tools to use when required. Wide open questioning techniques are designed to get the prospect talking about the topic you've selected. So select your topic and I'll show you how to form that first question. Try it, form a question that starts with one of the above and see if it makes sense to answer it with a one word or short response. 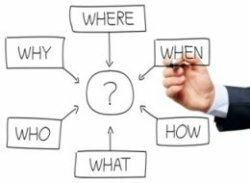 Open questions start with who, what, where, when, how, and sometimes why. Traditional sales training on questioning techniques uses open questions to start conversations. The wide open questions above do that far better. Open questions are best used to guide and give direction to the conversation. They can get the conversation back on tropic if it meanders off. And they're also great for keeping the prospect talking if they stop, especially if they are a low responder giving short answers. Wide Open Question: Tell me about your current service provider? Open Question: How does that work? We're midway down the sales questions funnel and now want more specific information to use to form the sales presentation. These questioning techniques are open questions that are made more specific to get information with greater detail. What's most important to you about the service provider? Who else deals with the problems? When will you be deciding on changing suppliers? Depending upon how much information you need from your prospects you may need to ask several layers of Specific Open Questions with each layer getting more specific. When you give prospects a choice of two or more alternative answers you get very specific information on what they want. Will you want them in red, blue, or black? Do we confirm dates with you or the site manager? Is less input or greater productivity more important to you? At this narrow part of the funnel you use the needs, wants, and desires, the prospect has given you earlier and question them on the alternatives available. It may be that the products and services you sell, and the industry you work in, don't offer alternatives and you can omit these questions and move straight on to the closed questions. A closed question is one that requires a yes or no answer, it's the narrowest part of the funnel. Closed questions and their responses give you very precise information. They can be used to check your understanding of the benefits the buyer wants. You gain commitment from the buyer that this is what they want and that helps you to close the sale. A closed question asked after other questions in the funnel to get specific information: Would a productivity increase of 20% be acceptable? To check your understanding of the benefits the buyer wants: So what you want is a productivity increase? To gain commitment from the prospect as well as information: Would you say a productivity increase is the key benefit that you will consider when making your decision? You now know what questions to ask and in which order to ask them. All you have to do is add the words to the questions in the funnel and you'll be able to confidently discover the information you need to form a successful sales presentation for any product or service. To help you to choose the right words for your questions I offer you more sales training, on creating a professional Sales Questions Stage, in my course Selling Success. It was developed while training working sales teams in a wide range of roles and all the techniques, like the ones on this page, are proven in real selling situations. The course is included in the Discounted 4 Courses Package that also covers making sales appointments, and has additional training on handling objections and closing sales. The Sales Questioning Stage is the second stage of your sales meetings with prospects. Follow the links to see all 5 pages in this section.